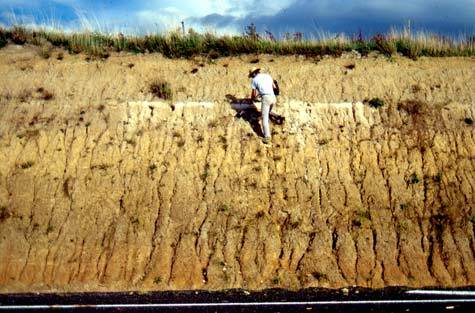 Thick layers of wind-blown dust, known as loess, accumulated over parts of the Manawatū region during glacial periods, when there was little vegetation. This roadside cutting is at Aokautere, near Palmerston North. The thin white layer in the upper part is Ōruanui ash, produced when Taupō erupted about 26,500 years ago.